Because fullsize luxury sedans don't necessarily have to be painted in a boring color. It’s safe to say the folks over at BMW Abu Dhabi Motors in charge of commissioning new cars are trying to stay away from bland colors as much as possible. 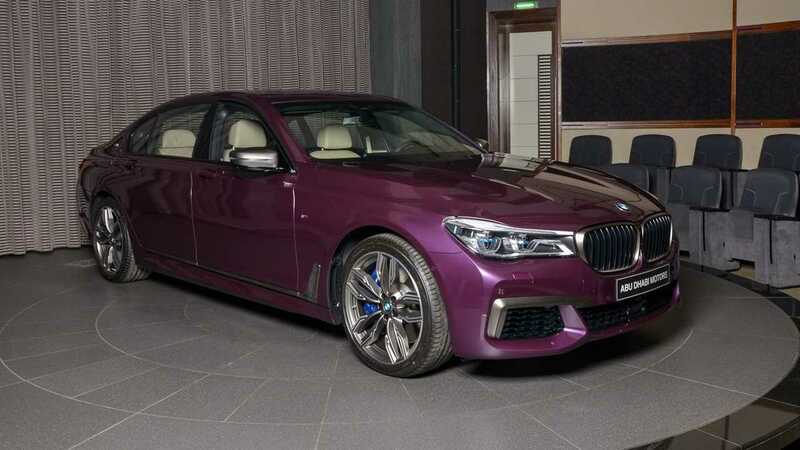 After seeing the M5 Competition in Rally Green and Austin Yellow in recent weeks, time has come to admire this fancy 7 Series finished in Purple Silk from the BMW Individual catalog. It’s not just any 7 Series taking into account we’re dealing with the top-of-the-line version, the M760i in long-wheelbase specification. Proof that the V12 badge on the rear pillar looks good on just about any color you can think of, this high-end 7er appears to have most of the toys you’d ever want from a sporty and luxurious big sedan, including laser headlights. The vibrant color is contrasted by gray accents at the front and rear, while those optional 20-inch M-branded alloy wheels are a perfect match. The interesting paint scheme does cost a pretty penny, but what’s another few thousand dollars when you’re buying a car that starts off at $156,700? The cabin unfortunately does not have the pizzazz of the exterior, although that dark wood trim blends nicely with the beige leather you see on the seats, center console, and the door panels. As with every other M760i, there’s a not-so-subtle V12 badge next to gear lever just to remind everyone this isn’t an ordinary 7 Series. Spy shots have shown BMW is about to give the 7 a mid-cycle refresh, and that will obviously include a mild update for the V12 luxobarge. Look for even more tech inside the cabin, along with an enlarged kidney grille and a sharper design of the headlights and taillights. An official reveal is likely slated to take place in the months to come.